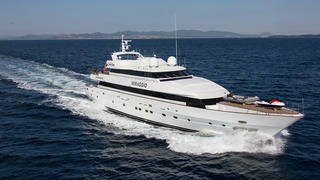 The 41 metre motor yacht Miraggio has been listed for sale by Philip Bell and Ed Dickinson at Northrop & Johnson. Built in GRP by Italian yard Siar Moschini to a design by Andrea Bacigalupo, Miraggio was delivered in 1988 and last refitted in 2015. Her interior in rich mahogany accommodates 12 guests in six cabins consisting of a main deck master and VIP suite while below are three identical doubles with queen sized beds and a twin, all with entertainment centres, new flat screen LCD television sets and en suite bathroom facilities. In addition, there are quarters for 11 crew. A large saloon has a bar, ice maker and fridge while there are two separate seating areas to port and starboard, each with settees, occasional chairs and coffee tables. A state of the art entertainment centre includes a large television screen and a media server offering over 5,000 films throughout this yacht for sale. Upstairs, the sky lounge continues the theme of relaxed enjoyment with ample seating, an entertainment centre and a formal dining area with seating for 12 guests. Outdoor areas are generous and include the aft deck behind the saloon with a fridge, ice maker and a teak table providing al fresco dining for 12 guests. Twin 1,280hp Caterpillar diesel engines give her a cruising speed of 11 knots and a range of 3,500 nautical while during her 2015 upgrade she was fitted with Naiad zero speed stabilisers.